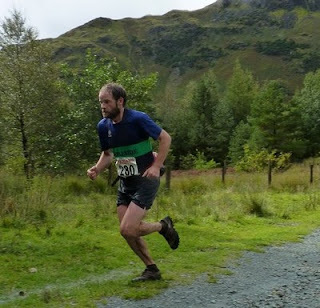 The Three Shires race is 13 miles and 4000ft, from Little Langdale up over Wetherlam, Swirl How, down to the Three Shires Stone then up to Pike O' Blisco, down to Blea Tarn then up one last time to Ling Moor and down to the finish at the start again. Gavin Bland's record is 1:45:08. All this group came in within a couple of minutes of Carl Bell's winning time of around 2:00. "Lightfoot and Bell passed and re-passed us four or five times before Ricky dropped out, and Carl decided on a tactical vest to follow! Great race with the front few chopping and changing all the time." 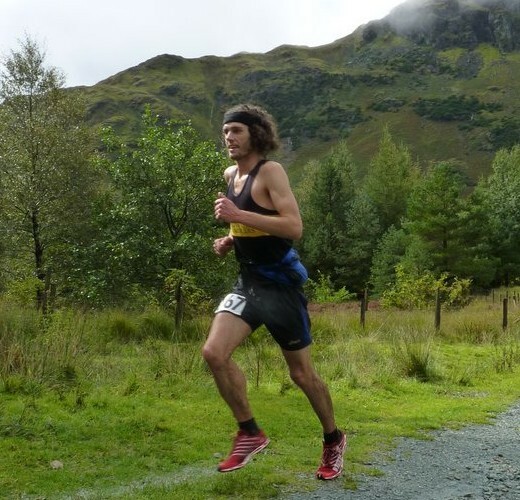 Dark Peak's Rhys Findlay Robinson and Stevie B from Borrowdale seemed to suffer on the final killer climb of Ling Moor. Results. "I slide where Hazel covers"
Hazel has won two Lakeland Classics this year, Wasdale in July and now the Three Shires - picture by Sarah Massey. Well done to Hazel & Carl.